Back in April and May, I did 10 projects that I submitted for the Artisan Award Contest. 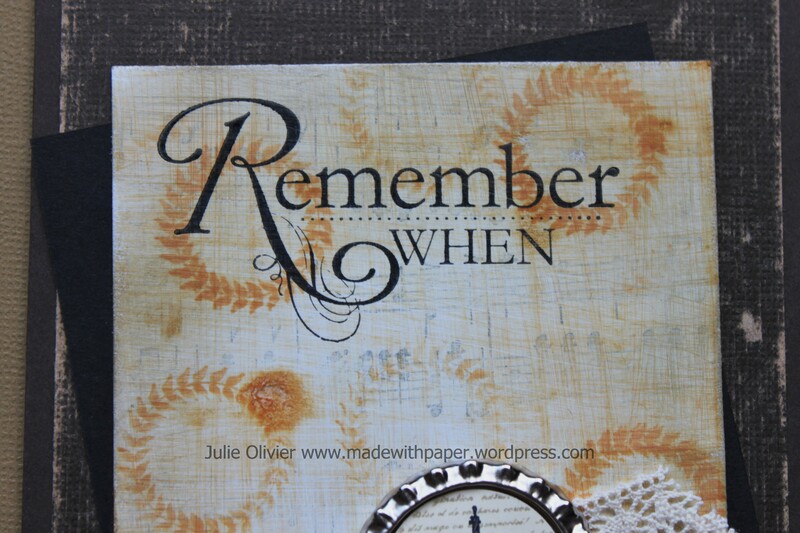 This contest is opened to all Stampin’up Demonstrators. 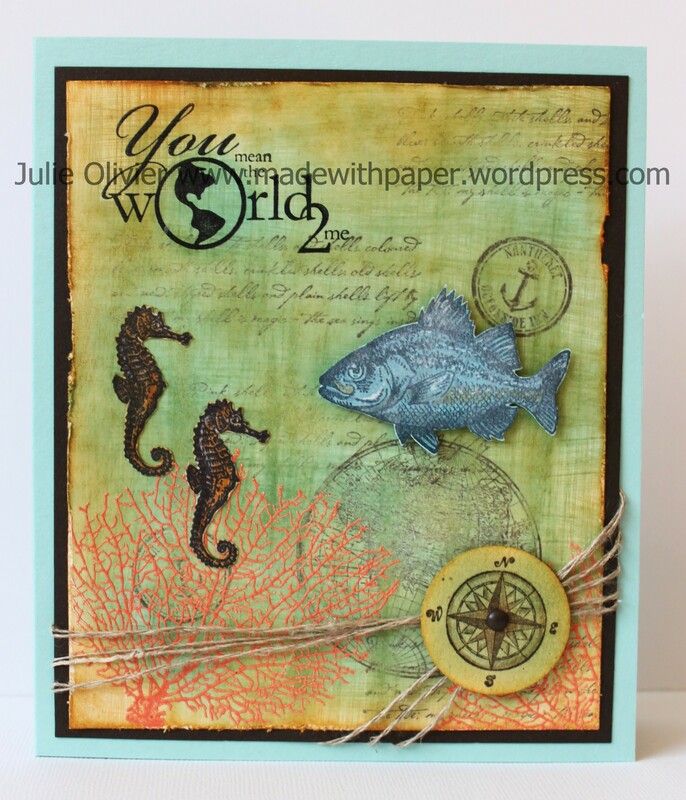 You need to create 10 projects that includes 5 cards, 3 Scrapbook pages and 2, 3D items. You must ship the whole thing to the Utha and hope that you will be picked!!! The winners were announced in July and I wasn’t selected. 😦 Since I spent a lot of time on these projects, I will share them with you, one per day for the next 10 days… I hope you will enjoy seeing the projects I made for this year! My project for today is one of my favorite card! I used the stamp set “By the Tides” and “Open Sea” (which are still available!) Let me know if you want to order any!!! It’s probably hard to imagine, but I started with a White glossy paper and made my own background for this card, using my sanding block, Pool Party and More Mustard ink and my sponge! (This technique is called “Faux Linen”. Check this post if you want to learn more about it!) 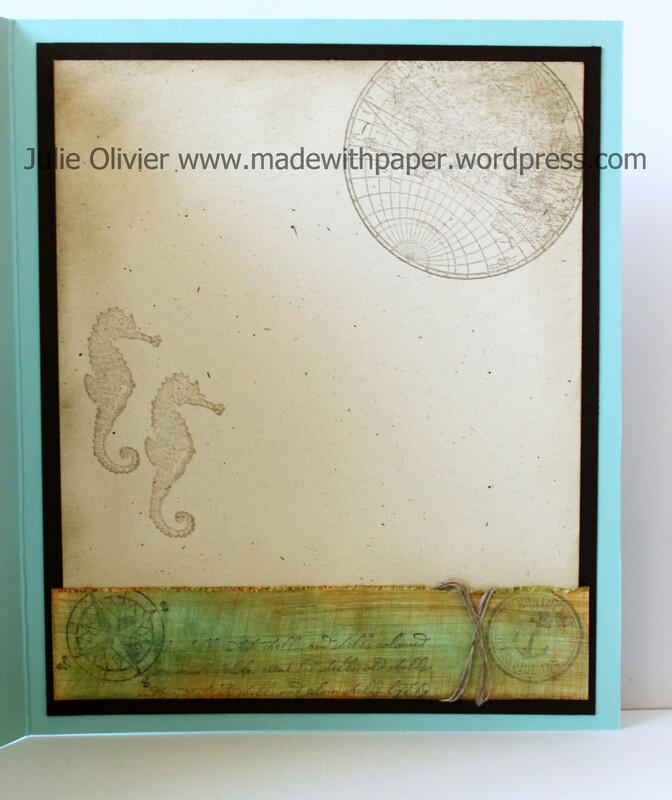 I stamped images from The Open Sea set and distressed them by sanding the paper. The edges were also distressed and torn using the scissor edges. I wanted to give an old parchemin look and was quite happy with the result! 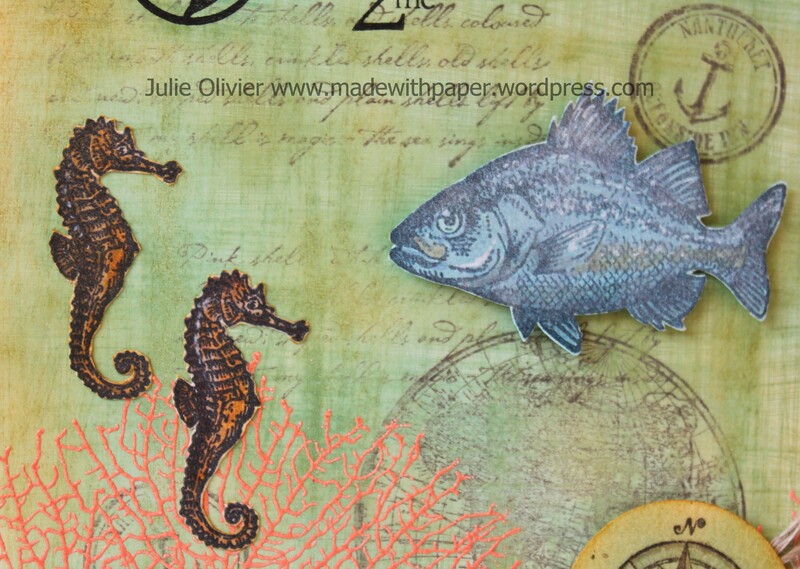 The fish and seahorses were colored with markers and cut with the paper snips. I used the Illuminate Glimmer Watermark ink to make them really shiny. I also used the White uni-ball Signo Gel Pen to add some white spots for the light reflection. The corals were heat embossed with Tango Tangerine powder. The greeting is from Word Play (now retired) and was stamped with StazOn Black ink. Heat Tool; Stampin’ Sanding Block; 1-1/4” Circle Punch, Paper-Piercing Tool and Pierce Mat; 3/16” Neutrals brad, Linen Thread; Sponge daubers; Paper Snips, Stampin’ Trimmer, Stampin’ Dimensionals, Multipurpose Liquid Glue, Snail adhesive. Last night, at our team meeting, I showed a pretty cool technique: Faux Linen. So here’s the card I made and I will give you the instructions below. 1. Start with a 3″ by 4-1/4″ rectangle of Glossy White cardstock. 2. Sponge all over with More Mustard ink. (You could also use the brayer.) Let dry a few minutes. 3. Using the sandblock, start sending your cardstock, going in only one direction (horizontally), then send it in the other direction (vertically). This creates fine white “scratched” lines. 5. 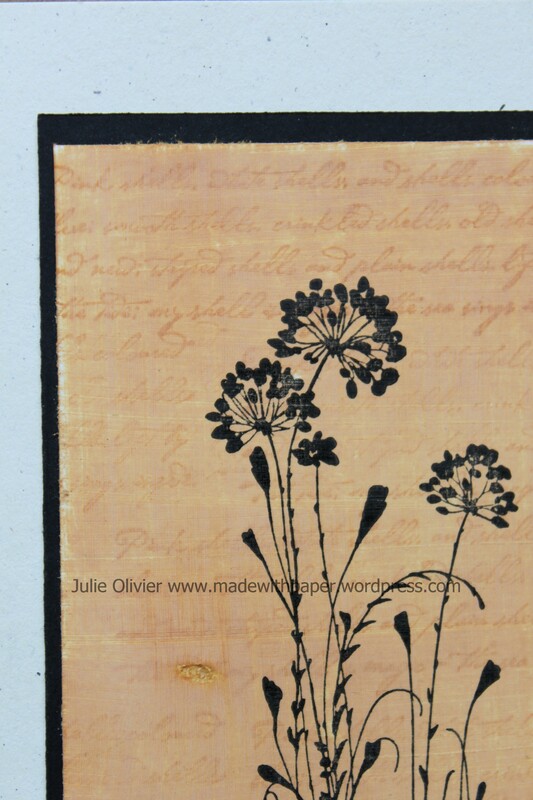 Stamp your flower image with Black StazOn ink. (from Serene Silhouette stamp set). Here’s another card I made with a similar technique. The only difference is that I started with the White Glossy card stock, stamped the Music notes (in black) and sanded it. Then I sponged with More Mustard and Crumb Cake ink. So for this one, the color goes in the “scratched” lines, where as in the first one, the scratched lines become white. 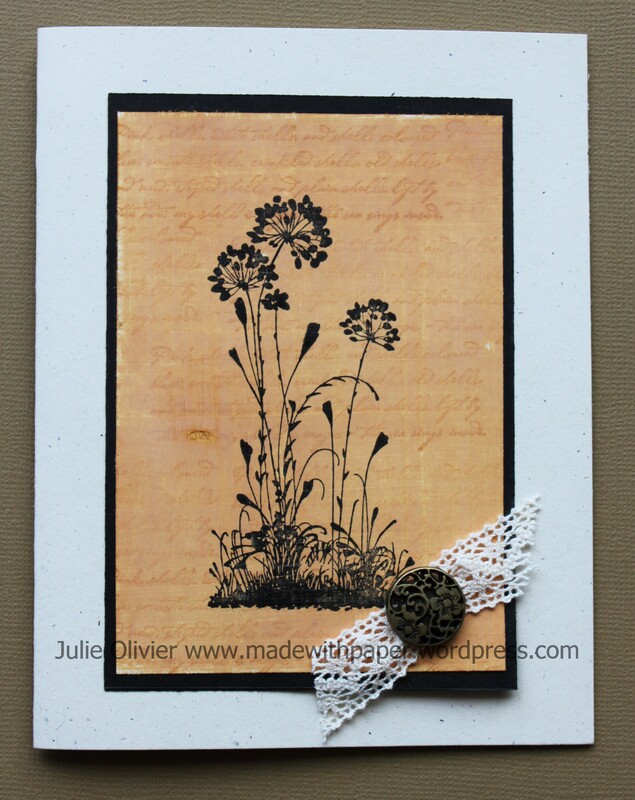 I used the “Collage Curios” stamp set to stamp in the background in More Mustard. I ran the bottle cap through the Big Shot to flatten it. 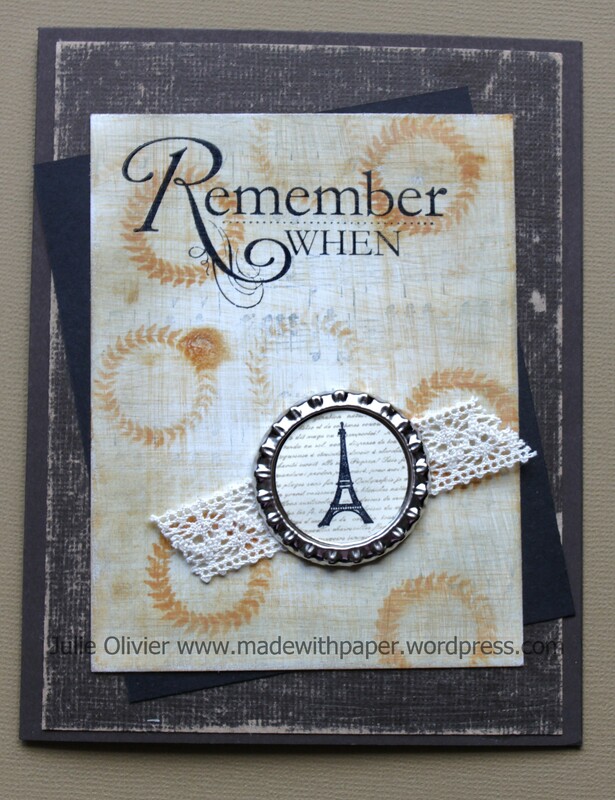 I stamped the Eiffel Tower (also from Collage Curios) on Vanilla cardstock and used the 1″ Circle punch to cut it. On the card base, I used the Early Espresso Core’dination card stock (from the Holiday mini-catalogue) and also sanded it. I think it goes really well with the look of the card!